With over a decade of experience, eLogic has developed an LMS implementation methodology which delivers a collaborative approach to designing your system while also ensuring the project is delivered on-time and on-budget. No one knows your organization’s culture and training requirements better than you. That is why deploying your LMS is a collaborative effort between your organization and ours. It’s the only way to ensure an effective system that works in your environment and promotes your values. Our implementation process is designed to minimize the impact on your organization, focusing on knowledge transfer from day one. The result is the highest level of client satisfaction in the industry. 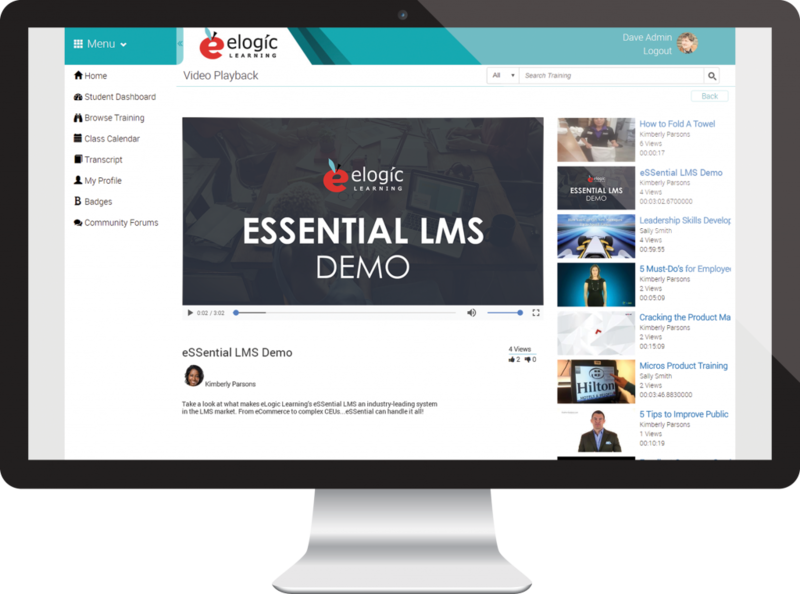 No matter what kind of implementation experience you may have had in the past, we here at eLogic want to make sure you know exactly what to expect from the moment you’ve sign on the dotted line to the point where you are in the LMS and running your training programs. Rest assured that eLogic’s implementation process has been battle-tested for almost 20 years to ensure your LMS is delivered on-time and on-budget. Implementation can be achieved in just eight weeks for most clients depending on your scope and the availability of your resources. At the beginning of the project you’ll be introduced to your implementation Project Manager. This person is well-versed in your organization and the training goals you’ve expressed. This in-depth knowledge comes from documents we’ll get your feedback on that include questions about your particular use cases and needs in the system. Next, we’ll hold a kickoff meeting to create a unique LMS implementation plan to ensure the most efficient process for optimizing your LMS. Our approach focuses on the leverage points for your team so that there is no wasted time during the implementation. We start the project by setting up an LMS sandbox environment. Our team will walk you through a comprehensive, easy-to-understand Design Survey that lays out all the available LMS configuration options. When included in scope, we will work with your Subject Matter Experts and IT team in defining your integration and data conversion requirements. Once the Design Survey is complete, we’ll build out your LMS production environment based on your stated specifications, along with those in the Branding Document and the Pre-Implementation Client Questionnaire you will have completed by this point. The eSSential LMS has a robust set of web services and data load programs to allow for seamless transmission of data to and from the LMS. The conversion and integration phase of the project runs parallel to the business design phase. Our team works side by side with your IT resources. Our training consists of relevant use-case scenarios completely tailored to your business. Training is client-dedicated so that we can focus the training on the areas most important to your team. This approach is significantly better in driving expedited success compared to a generic training session where multiple clients are present. We want to make sure we’re setting your organization up for success, so we have developed a comprehensive training program to get all administrators up to speed on how to utilize the system. We provide a full 10 hours of training that is broken up over a three-day period. Clients may also receive four 2-hour configuration sessions where a support team member will be present to oversee and guide you through configuring the system including adding users and courses, setting up learning paths, etc. After launch, a two-hour deep-dive LMS Reporting training session is scheduled. Our goal with this knowledge transfer approach to the implementation is to make your go-live date an afterthought. Your team will be confident in their expertise of the system and will be able to concentrate on driving your business model objectives. The testing process is multi-faceted. We advise your team on best practices in User Acceptance testing of your LMS setup, data integration routines, and converted historical data. Acceptance testing gives your team time to review the fully configured environment to ensure it has been set up correctly and that any data conversions performed or third party data feeds are working as designed. Working closely with your IT team, we help in mapping your historical data, such as user records, transcripts, in-process registrations, etc. After a quick eLogic quality assurance review that everything is operating normally, we turn over the environment to your team and you can begin to use the system. Our process is structured to eliminate any surprises after launch. Your team can rest easy knowing that the system and integrations are running smoothly and creating a great experience for your end-users. Once testing and production setup are complete, you are ready for the launch! Because of all the preparation leading up to this point, there is no stress involved. We also provide recommendations and materials to assist with creating and executing a successful roll-out strategy. During implementation, one of our main priorities is to make sure we answer your questions, resolve issues, and keep your project on track. Once your LMS is launched, our award-winning support team will also be standing by to help you whenever you need it. As you search for an LMS, it’s important to find a system with the features and functionality your organization needs. However, your evaluation shouldn’t stop there. Each vendor will have their own approach to implementation varying not only in price, but in the amount of resources and technical support required by both parties. To help you evaluate these offerings, we’ve compiled data on the most common implementation models offered by LMS providers. 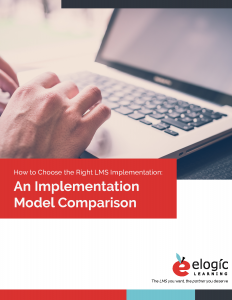 To learn more, download our “How to Choose the Right LMS Implementation: An Implementation Model Comparison” guide to the right.